TORONTO -- Jurors deciding the fate of a Toronto police officer charged in the fatal shooting of a teen on an empty streetcar were asked Monday to assess the evidence in the case with an open mind. In his instruction to the jury, Justice Edward Then said the Crown must prove beyond a reasonable doubt that Const. 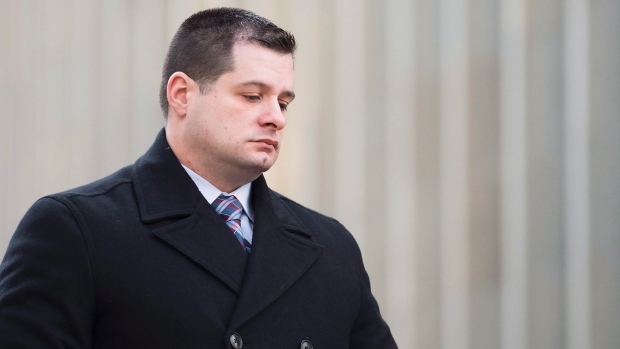 James Forcillo is guilty of second-degree murder in the death of Sammy Yatim. "If you believe that officer Forcillo is probably guilty but no more, then in those circumstances you must find him not guilty," the judge said. Forcillo has pleaded not guilty to second-degree murder and attempted murder. The jury has heard that on a night in July 2013, Yatim had taken the drug ecstasy before boarding a streetcar where he pulled out a small knife, prompting panicked passengers to rush off the vehicle. Videos and audio played at the trial have shown that Forcillo arrived on the scene, yelled repeatedly at Yatim to drop the knife, and after a 50-second confrontation fired nine bullets at the teen. Crown prosecutors argue Forcillo's actions weren't necessary or reasonable but his lawyer contends the officer's actions were justified and carried out in self-defence. The judge highlighted the fact that Forcillo had testified in his own defence, reminding the jury that the officer got "no special marks" for doing so. "You assess his credibility in the same manner as you do with any other witnesses. What he says may be evidence for or against him," Then said. He noted, however, that Forcillo's testimony had to be carefully considered. "If you believe the evidence of the accused then you must acquit him," Then said. "If you do not believe the evidence of the accused but are left in a state of reasonable doubt on the evidence of the accused, then you must also acquit him." The jury also didn't need to find a motive or reasons for Forcillo's actions on the night Yatim died, Then said. "It is for you to decide whether officer Forcillo had a motive or any motive at all, and how much or how little you will rely on it." Forcillo has told the jury that he believed Yatim was going to rush off the streetcar and launch an attack when he said he saw the teen flick his knife towards him. The jury has heard that when Yatim took a few steps back to the spot at the top of the streetcar steps, Forcillo -- who had warned the teen not to take another step forward -- fires nine bullets at Yatim in two separate volleys. The teen collapses immediately. The entire standoff lasted about 50 seconds.